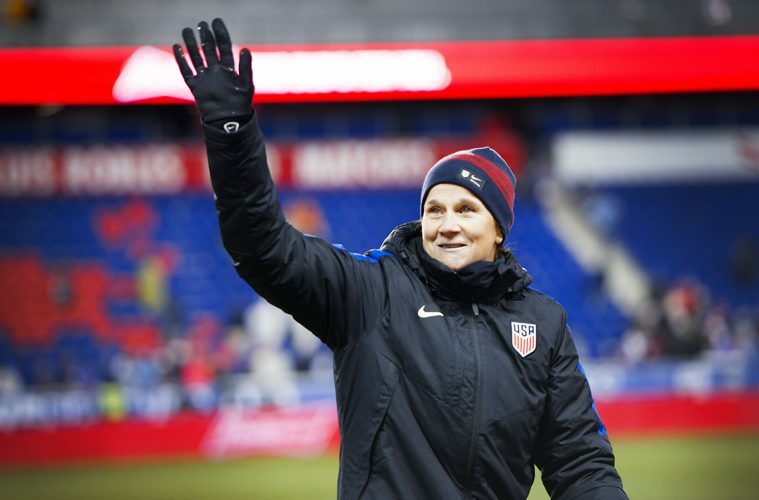 Jill Ellis says she won’t “dwell” on the USA’s performance against Scotland and will now look ahead to 2019 and the final countdown to her side’s defense of the Women’s World Cup in France. The U.S. completed an unbeaten 2018 with a tight 1-0 win against Shelley Kerr’s Scotland thanks to Alex Morgan’s close-range finish toward the end of the first half. But the visitors found themselves under pressure from the 19th-ranked side in the world from the off and on another day Scotland could easily have walked away with something from the game, but Ellis, who was born in England and her mother from Scotland, praised their opponents and admitted it was a challenge her side needed. The trip to face Scotland and Portugal last week was the first trip overseas for the U.S. since the summer of 2017 when they walked away with 1-0 victories against Sweden and Norway. Recording identical results this time around against different opposition, Ellis said the trips abroad are crucial for World Cup preparation with the U.S. set to return in January to play hosts France in Le Havre. Ellis made several tactical tweaks during the match to test out players in a variety of players. Starting with a back four of Emily Sonnett, Abby Dahlkemper, Becky Sauerbrunn, and Emily Fox and a midfield three of Crystal Dunn, Rose Lavelle, and Julie Ertz, Ellis led with Carli Lloyd as the No. 9 with Alex Morgan left and Mal Pugh right. The introduction of Jess McDonald for Sonnett, who endured a tough night against Claire Emslie, saw Fox switch to the right, Dunn into left back and Lloyd drop back into Dunn’s midfield spot. Just five minutes later, Danielle Colaprico came on in a move that saw Dahlkemper shift to the right and Ertz drop back into her old position of center back alongside Sauerbrunn. Despite some tinkering, Ellis believes her side now know their roles and the only thing left to do is to perfect the system before heading to France next summer. “We’ve settled into a system coming out of the end of last year and the players now have a good understanding of how we want to play and how we want to look on both sides of the ball. Ellis also reserved praise for Scotland and head coach Shelley Kerr, whose side pushed the U.S. all the way and should have equalized late on when Lana Clelland found herself one-on-one with Ashlyn Harris. The hosts also had a chance in the opening minutes when Emslie failed to connect properly with Caroline Weir’s free kick and Alex Morgan had to hook an Erin Cuthbert corner off the line. And Ellis isn’t surprised to see more teams announce themselves as tough-to-beat opposition on the world stage. It’s a sign of the times. Women’s football in general has evolved and you see the emergence of teams like the Netherlands recently.